Thanks for trying out bcbio. The configuration generally looks great although you should add `variant_regions: ../input/NGv3.bed` to each of the samples so they all get called only in exome regions. Let us know if you have any problems. You’re welcome to ask questions here but the Biovalidation mailing list (https://groups.google.com/forum/#!forum/biovalidation) or GitHub issues page (https://github.com/chapmanb/bcbio-nextgen/issues) might make formatting and discussion easier. Thanks again. Thanks so much for your reply. I have another question: there are wgs and wgs_joint two pipeline which one should I take for my 30X whole genome data, and what’s the difference between them. Thanks again! Joint and pooled calling differ in how they combine inputs from multiple samples in a population. This recent blog post goes into more details: https://bcbio.wordpress.com/2014/10/07/joint-calling/. Both approaches give similar quality results but joint calling will scale to a larger number of samples. Hope this helps. I downloaded that bed file of LCR. Then asked the percent of the genome it covers. It covers almost 10%. Can you tell me why is it listed as 2% in the sentence? Sorry for any confusion. 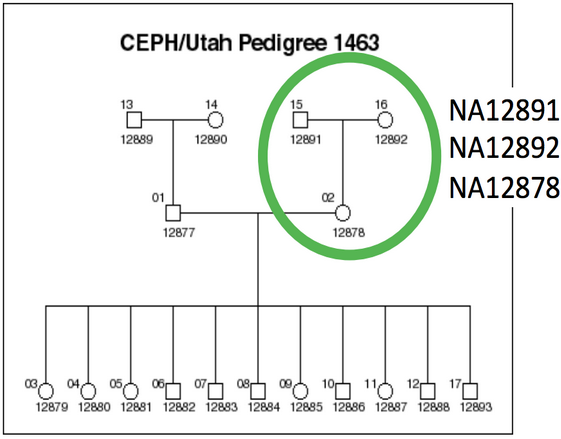 The LCR file also includes non-resolved (N-only) regions in the genome, primarily near centromeres and telomeres. 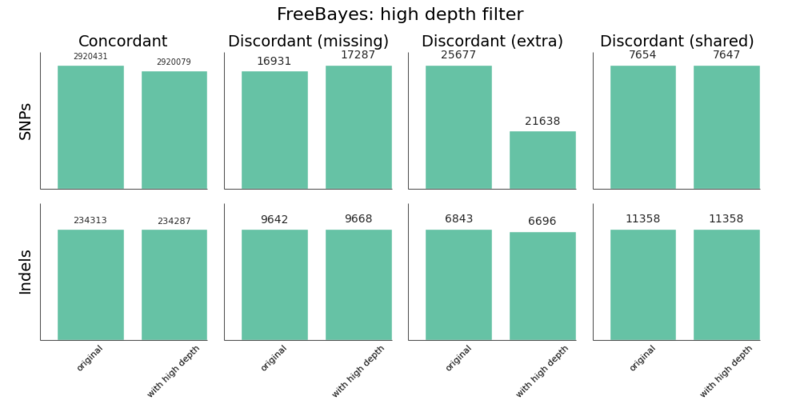 This makes up ~8% of the total BED file size, and the remainder are the smaller low complexity regions specific to this dataset. Hope that helps. Can you share what was the read length in the data you analyzed here, as this should be a critical parameter on how reliable SNVs in shorter LC region are. 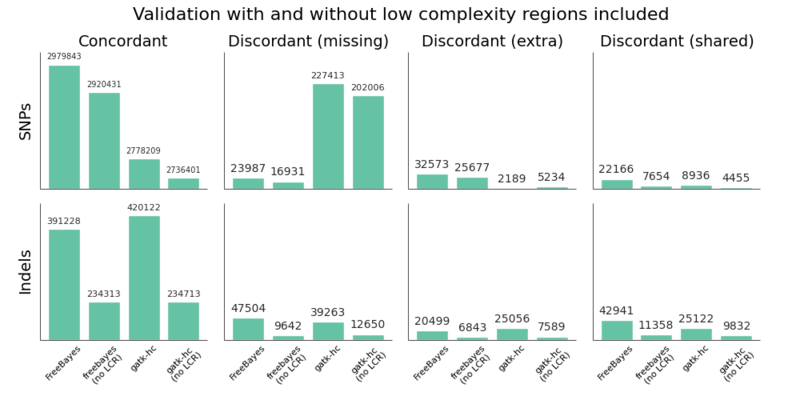 I personally find it strange to categorically exclude LC regions, as there are regulatory elements and coding sequences fully co-located with LCs, hence any mutations there would be impossible to pick up. Thanks for the helpful feedback. These are 100bp paired end reads (https://www.ebi.ac.uk/ena/data/view/ERR194147). The purpose of excluding them is not that they’re unimportant, but that the truth sets we current have do a poor job of resolving these regions in a general way. Since a small percentage (2%) of the genome contributes to a large portion (45%) of the calls, this masks how callers do in the remainder of the genome. The right way forward is to have specialized truth sets that carefully resolve medically important mutations in LCRs in an unbiased way so we can determine how well callers do in these regions and continue to improve them. As always, lots of work to do to continue to improve truth sets and callers themselves. Thanks again for the discussion.